The Boogie Man Nebula looms in deep space. The "Boogie Man Nebula" haunts the cosmos in this deep-space image by astrophotographer Jeff Johnson. 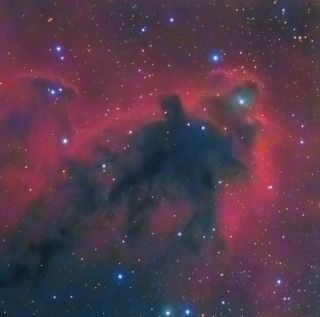 Also known as Lynds Dark Nebula (LDN) 1622, this dark cloud of interstellar dust and gas lies about 500 light-years away in the constellation of Orion. Over this trio of attempts, Johnson collected a total of 5.3 hours of exposure. The resulting image combines H-alpha data (a wavelength of light emitted by glowing hydrogen) collected during his most recent imaging session on Nov. 24, and RGB (color) data from his first shot of the nebula taken on Feb. 11, 2016, Johnson said. About a year after he took that first image, Johnson revisited the Boogie Man Nebula with a new telescope. But the image came out blurry, and too much light pollution made the color data unusable. When he tried again last November, the light pollution ruined his color data again, but the image came out sharper. "As luck would have it … clouds rolled in through part of the data session," Johnson said. "Each attempt … takes me one hour of setup time, since I use a portable setup that I take down the next morning after every session," Johnson said. His setup includes a Takahashi TOA-130F refractor telescope and a QSI 540wsg cooled CCD camera equipped with a H-alpha filter and LRGB filter. For his first image in 2016, Johnson used a Takahashi FS-60C to capture a wider shot of the nebula.